What can CTCX do for you? Is Your Warehouse Secure and Safe? Is Your Warehouse Easy to Access? We can accept your loads for misdelivered appointment load anywhere in our radius. We can accept multiple truck loads and consolidate them into individual or combined loads to make deliveries cost effective. Utilizing our forwarding division we can expedite freight anywhere in the continental United States. We can LTL your SCF deliveries to all post offices in New England. We can deliver your mailings to all newspapers in New England on time for distribution. We can handle your truckloads anywhere within our 200 mile radius. We can deliver your high value shipments via our blanket wrapped air-ride logistic services. 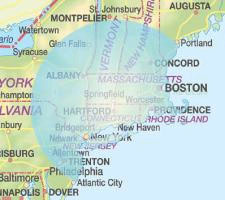 We can handle your distribution in New England from any points in Massachusetts and Connecticut. With our company fleet, we can deliver up to 200 miles from our Windsor Locks location. With our brokerage division, SAK Logistics, we can handle freight anywhere in the 48 states. Security includes a lighted parking area and 24 hour cameras in the warehouse, offices, and outside. It is open 0600-2200 Mon-Fri 0800-1300 Sat and on call any other time if needed. We have plenty of parking and easy access. The warehouse is located in Windsor Locks, Connecticut on 5 1/2 acres of land.